Way back in 2015, we wrote a post about the bewildering world of telepractice reimbursement. It’s definitely time for an update, but where to begin? As with everything, it is tricky to provide basic information for newer consumers as well as more advanced information for more savvy consumers. ASHA’s Special Interest Group for Telepractice (SIG 18) faces this exact issue when deciding how to provide professional development content for its members. How do you teach SLPs and AUDs that are new to telepractice what they need to know, and at the same time be a resource for experienced practitioners? Fortunately, in the domain of telepractice reimbursement, you don’t necessarily need to know all that has gone before. What you do need to know is that it changes frequently and that it’s important to stay current. 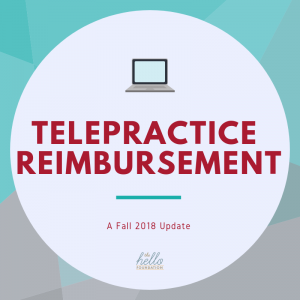 If you’re a new practitioner or wanting to get started, you’ll want to check out ASHA’s statement on telepractice reimbursement. In brief (because I can’t help myself), they explain that insurance reimbursement is a checkerboard across states and between state, federal, and private entities. The best way to figure out whether or not any given insurer will reimburse for telepractice services is to call them and ask if they cover the modifier GT or the place of service code 02. This is one constant across time that is unlikely to change anytime soon. All telepractioners, both new and seasoned, should be aware that the Centers for Medicare and Medicaid Services (CMS) recently released proposed changes to the 2019 Physician Fee Schedule and Quality Payment Program set to take effect January 1st, 2019. These are considered to be big changes in telemedicine and worth taking note of. I really want to dig into these codes and services and how they might relate to our services, but that’s a whole ‘nother blog. I’m loving these changes because they reinforce the notion that telepractice is a way we deliver service, not the service itself. It’s common in our field to think of telepractice in one way — services to schools. However, I find this so limiting. Clinicians in all settings provide myriad services, from consultation to training, diagnostics to treatment, and beyond. The new CMS proposed changes acknowledge that telepractice is not a one-size-fits-all modality. We need these options because we do a lot of different things. We also want parity in the amount of reimbursement for in-person services as for teleservices because teleservices are of equal value to those delivered in-person. Changes to telepractice reimbursement will continue to come, but as Lauren says, anything that increases access to care is a step in the right direction.